If you are looking for a climbing plant with flowers for late in the summer then Rhodochiton astrosanguineum could well be it. Grown both as an annual and a perennial depending on the climate, this attractive plant is from Central America. The umbrella shaped flowers are large and are an attractive deep purple. 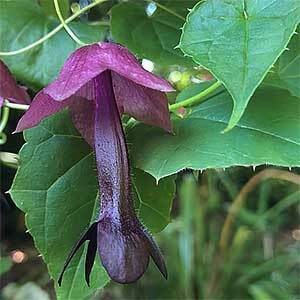 With two toned pink and purple flowers and soft green heart shaped foliage Rhodochiton atrosanguineum is commonly called the ‘Purple Bell Vine’. Although it is sold as a climbing plant it is also often grown as a trailing plant in containers and hanging baskets. The flowers first emerge as small and lampshade like, as the mature the long, deep purple corolla emerges, all of this held on thin wiry stems. A very attractive rapid growing climber to 3m flowering from spring though summer and dies back in colder weather. Propagation from seed in spring is easy and the long flowering period make it a worthwhile addition to the garden. Try them in a hanging basket or a container on a frame. Rhodochiton atrosanguineum is not frost tolerant. Easy from seed which can be sown indoors in mid winter. Germination can be slow, taking up to 1.5 months. Keeps seeds moist and at a fairly even temperature of around 17C. Seeds are best planted in small tubes, 2 – 3 seeds in each tube. In spring once the weather warms up, plant the seedlings out into a warm sunny position in a humus rich moist soil. Propagation from cuttings taken in spring is also easy.